Understand how to utilize the workbench, console, adapters, publisher, and other components in Scribe to ensure you have a rapid development toolkit that will drastically reduce your workload and timeline. 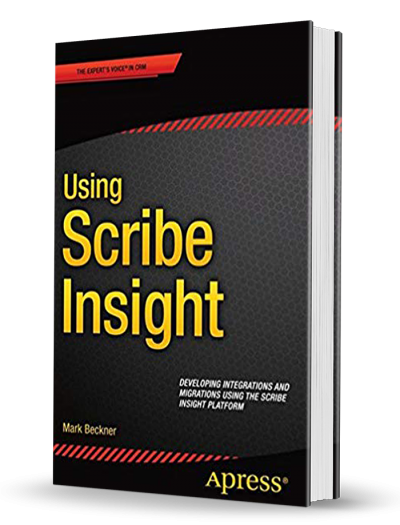 In Using Scribe Insight, you’ll learn to build your integrations and migrations with the minimal amount of effort, what shortcuts can be taken to simplify and reduce your labor, and what techniques can be used to keep your solutions as simple as possible. You’ll find discussions that span the full product, from installation and configuration of the core product and use of the development workbench to advanced concepts around mapping, administration, troubleshooting, and optimization of packages. You’ll also be introduced to Scribe Online, how to do basic development within the environment, and how to determine when to develop solutions in Online vs. Insight. All developers or solution architects working within the CRM space, including Salesforce and Dynamics CRM, will eventually need to either migrate or integrate data from previous versions or external systems. Scribe is the leading platform for these integrations and migrations.